Fact: 20% of deaths in children under 5 are caused by lower respiratory infections. And in countries that lack medical infrastructures, the rates are even higher. Enter the Continuous Positive Airway Pressure (CPAP) device, also known as the Baby Bubbler. 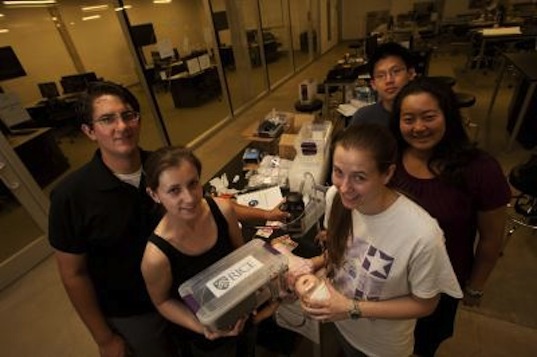 The bubbler is a portable respiratory support device that allows ailing babies to breathe without ventilators. Developed by a team of Rice University students, the Baby Bubbler consists of a flow generator that pumps air through a tube as well as a water bottle that acts as a regulator. Infants breathe with help from nasal prongs attached to the tube. The $140 prototype bubbler will be demonstrated in Malawi and Lesotho this summer as part of Rice’s Beyond Traditional Borders global health initiative. The next step after that is clinical testing. And eventually, the students hope that the bubbler can drastically cut down on deaths in under-5 children in the developing world.